Interdisciplinary science – what should we measure, and why? Research impact assessments of academic environments with bibliometric indicators are becoming increasingly important. Not only do they define where you are placed in international rankings of research institutes, but they are also being used as a basis for distribution of funds. This might sound like a smart and simple way to secure funds for world-leading researchers. But it could also create difficulties for interdisciplinary research environments. Here is one example. So, is resilience thinking (from a social science perspective) in crisis? If the ambition is to target mainstream top-political science journals, we sure are. Two issues could be raised here however. One: is this really the best way to measure our impact in the social sciences? Why not (just as one example) look for articles that reference Holling’s, Folke’s or Elinor Ostrom’s work for example? A second, and I would argue more important objection to the analysis, is whether the sort of metric Olsson uses really captures the core ambition of interdisciplinary research. Bluntly put: isn’t the whole point of building interdisciplinary teams, teaching, methods and research networks, to create innovative sustainability science that is hard to classify as “social” or “natural”? These articles are not likely to fit easily into mono-disciplinary social science journals. If that is the case, how do we measure the scientific success of such attempts, without contributing to an artificial split between the “social” and the “natural”? I assume many of you have had similar experiences or thoughts. Feel free to share in the comment field below. ISI’s new impact factors are out. While there are lots of problems with impact factors, particularly for comparing across fields, they influence where people send their papers and the evaluation of researchers. So it is good news to see that Ecology and Society‘s impact factor rose substantially in 2010 vs. 2009. The 2010 impact factor was 3.310 vs. 1.735 in 2009. However, because E&S publishes relatively few papers a year (92 in 2009, 95 in 2008, 71 in 2007) there is a lot of jumping around from year to year, and at least some of this jumping around is due to ISI undercounting citations to ES due to problems of inconsistency in the citation of electronic journals (no page numbers). However, despite this variation 3.3 is well above the average IF of the previous 4 years of 2.5. Also, Global Environmental Change, another journal that publishes a substantial amount of resilience research saw its impact factor also rise to 4.918, well above the previous four year average of 3.45. ﻿﻿﻿﻿The Growing Importance of Social Learning in Water Resources Management and Sustainability Science by Claudia Pahl-Wostl and others. I will more broadly look at impact trends in resilience related journals later in the summer. The impact of journals over the short and the long term is often quite different. ScienceWatch.com presents journal impact factors based on the longer term impact of journals in environmental science and environmental studies. 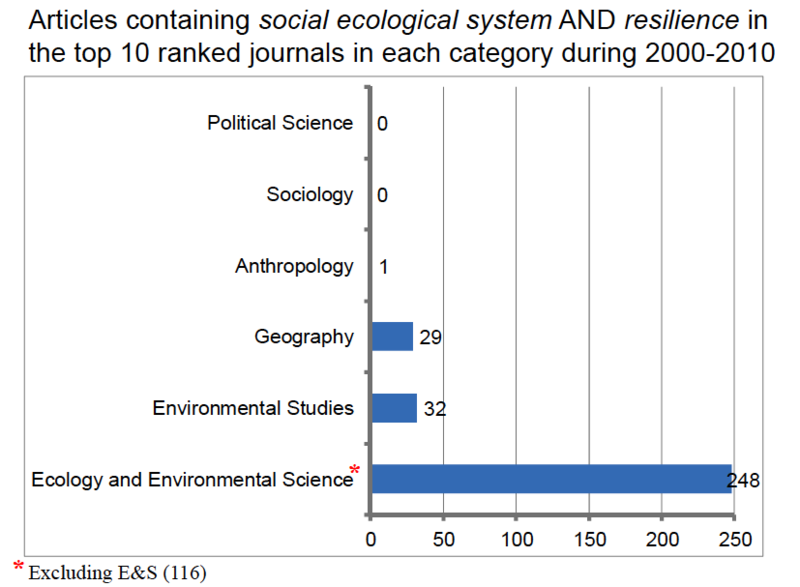 Below are rankings in environmental science for between 1998 and 2007, which only include journals cited over 10,000 times between 1998-2007.
note: The data for the multidisciplinary journals listed – Science, Nature, and the Proceedings of the National Academy of the USA – take into account only those articles that have been classified by Thomson Reuters as ecology and environmental sciences papers. And, using a slightly different system, journal rankings in Environmental Studies. Note the contrast in short and longer term rankings. It is unclear whether these are due to changes in the journal over time, or speed of citation. 1 Ann. Rev. Envir. Res. (4.04) Ann. Rev. Envir. Res. (1.80) Int. Region. Sci. Rev. 6 Harvard Env. Law Rev. 8 Int. Region. Sci. Rev.